If you're unfortunate enough to suffer from allergies then you'll be more than aware of how tough and irritating it can be! When you're exposed to a humid environment you're susceptible to dust mites, mildew and mould. 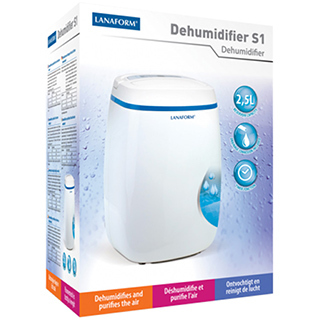 If you find that you're suffering a lot then you'll benefit from the effects of this Lanaform Dehumidifier. How does this electric dehumidifier work? It uses a suction mechanism to extract humid air from the room it’s in. This air is then filtered and directed to the condenser at a lower temperature. The water vapour in the air turns back into water, which is then collected in a tank. The “dried” air is then returned back to the room free of ‘nasties’ so you can enjoy fresh, clean air. The most comfortable, relative humidity for human beings is between 45% and 55%. The dehumidifier can operate in manual or automatic mode depending upon which you prefer. It incorporates a timer function, which allows you to program the automatic shutdown of the appliance. You might not know it - but this is why a humidifier is essential to a healthy home! There are numerous benefits to having the Lanaform Dehumidifier S1 in your home, work space or basement. It will make your home less hospitable to allergens such as mildew, mould and dust mites that grow in humid areas. Think about the black bits in your shower and bath tub, they are not just a nuisance, they are a real health hazard! Your dehumidifier will help to eliminate those musty smells in your home. It will help eliminate mould forming on your linen and other upholstery items and clothing. Your dehumidifier will help reduce irritation to your skin and your respiratory system helping you to breathe more easily. Your clothes will dry faster and your food will stay fresher for longer so you will save money! You will notice you need to dust less and a lot of it will be eliminated which is a real bonus! Modern in its appearance and attractive in design, the Lanaform Dehumidifier S1 won’t stand out like a sore thumb in your home, it will blend in nicely and do its job proficiently. Don’t suffer from the harmful effects humidity can cause any longer, take action today! To clean the water tank and its cover, first switch off and unplug the appliance. Use the clean, warm water to avoid any risk of mould growth. Dry the tank and its cover with a soft, dry cloth.